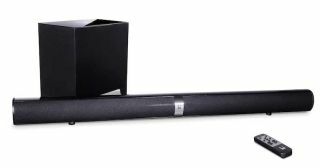 Roth AV launches £149 BAR 2LX soundbar with wireless subwoofer | What Hi-Fi? There's a new soundbar on the way from Roth AV, with aptX Bluetooth streaming and a wireless sub. The Roth BAR 2LX goes on sale in the UK from 14th August. Total power delivery is a claimed 120W and there are four full-range drivers within the soundbar's cabinet. The wireless subwoofer can be placed up to 30 feet from the soundbar, and the latter can be placed under the TV, on a table or wall mounted. There are stereo RCA analogue and optical digital inputs, as well as Bluetooth for wireless streaming from compatible devices. It measures 7.5 x 94 x 5cm (HWD) and the matching subwoofer 15.4 x 27 x 26cm (HWD).